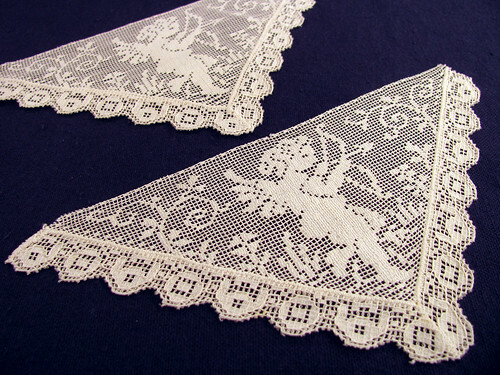 More vintage lace of which I do not know the date. I love these little triangles. The sides are approximately 5″ long and the top is a little over 7 inches wide. The design is nice for filet crochet, except the finished piece would be huge, unless really small thread and hook were used. It is hard to get open squares that small though. Maybe cross stitch would be better. Anyway these lace corners are special. Wouldn’t it be nice to be able to get fine laces like these nowadays? This entry was posted on Monday, March 9th, 2009 at 3:50 pm and is filed under Lace and Vintage. Tagged: Lace, Vintage. You can feed this entry. You can leave a response, or trackback from your own site.